I am very excited because I am bringing you Fallout Shelter a great game made by Bethesda. I am a great fan of the Fallout games. From the first to the last but now we are looking at a great mobile version of the game. Fallout Shelter is the first mobile game from desktop and console giant Bethesda Softworks, of fame primarily for their work on the Elder Scrolls and Fallout franchises. Bethesda is no stranger to success, and the titles developed by their in-house division (Bethesda Game Studios) have generally been smash hits. The Elder Scrolls III: Morrowind, Fallout 3, The Elder Scrolls IV: Oblivion, and The Elder Scrolls V: Skyrim were all highly successful games, and the upcoming Fallout 4 already has fans hugely excited for the next installment of the modernized post-nuclear role-playing phenomenon. Fallout Shelter is a beautifully simple game from a structural point of view. You have a vault. You can build rooms in the vault, and people can do things in the rooms. The vault is just a two-dimensional grid laid out like you’re looking inside an ant farm (except it’s a people farm). Inside these rooms, you place your vault dwellers, grabbing them Roller Coaster Tycoon style and plucking them up and setting them down where you’d like them to go. What happens in the rooms? Things! Let’s explain the basic mechanics. The first mechanic to know is resources. You have power (electricity), water, and food. Those are your necessities. You have a baseline requirement for each of these resources, and you gather them by building rooms that generate them. If you have insufficient power, some of your other rooms will stop functioning. If you have insufficient water or food, your vault dwellers will start losing health over time. The only reason I can tell that water and food are separate resources is that Bethesda felt like there needed to be three things to “balance” production of. You also have caps, which are the currency you use to build and upgrade rooms. The second mechanic is dwellers. 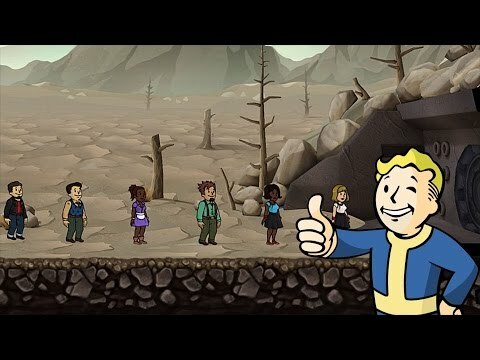 Your vault starts with a few people, and from there you go through a tutorial explaining how to build rooms, which rooms to build, how they work, and how to progress. Here’s the gist: you build your three resource rooms, you assign people to them, and then you also build “living quarters.” The third and final major mechanic is the wasteland. The wasteland isn’t something you interact with – you send vault dwellers into the wastes and they go “explore.” You can monitor the status of their exploration via text feed on the exploration UI (you can’t actually see what they’re doing). Sometimes if you really play this game for a long time it might be a little boring, but I am sure that this is not going to happen to you. It’s a great game and everyone must try it. It is free so just download it!